I'm still playing around with my Distress Oxides and loving them. 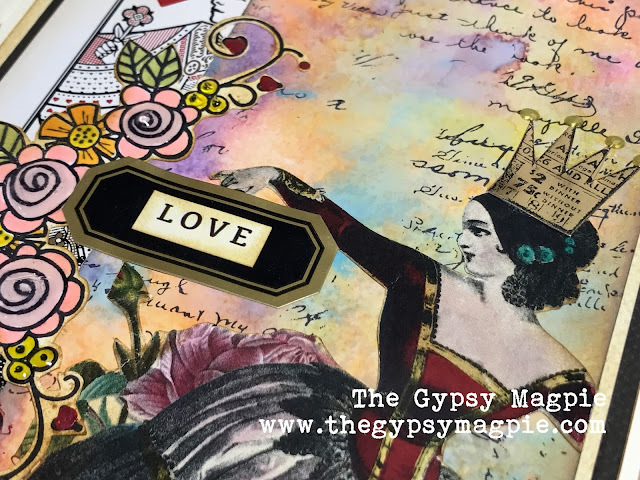 I experimented with a shipping tag, then over-stamped it with the Dear Ruby stamp by Tammy Tutterow... it makes a great background for just about everything. 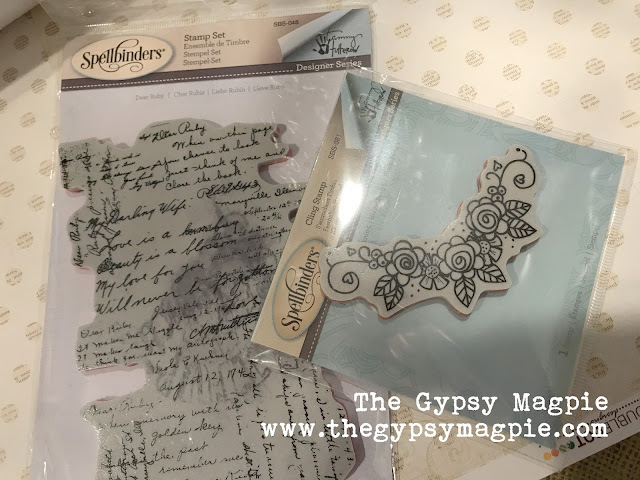 It's wonderful size- large enough to completely cover a card front- also works beautifully on smaller pieces (like this shipping tag). Here it became part of the background on another page in my blank art journal. The Happy Gram Flower Swag stamp's curve kind of mimicked the swirl of ink. I stamped onto white cardstock, colored it in with some Nuvo pens, fussy-cut the image and layered it into the mix of images, playing cards and mini labels. The golden crown was stamped onto foil paper and embellished with Nuvo Crystal Drops that added dimension to it's points. The crinkled seam binding is from my own Etsy shop and is my favorite thing to tie onto tags. These smaller size collage pages come together rather quickly and are really very satisfying. It won't be long before my entire book will be filled with things that make my soul happy! How fun is this, Terri! 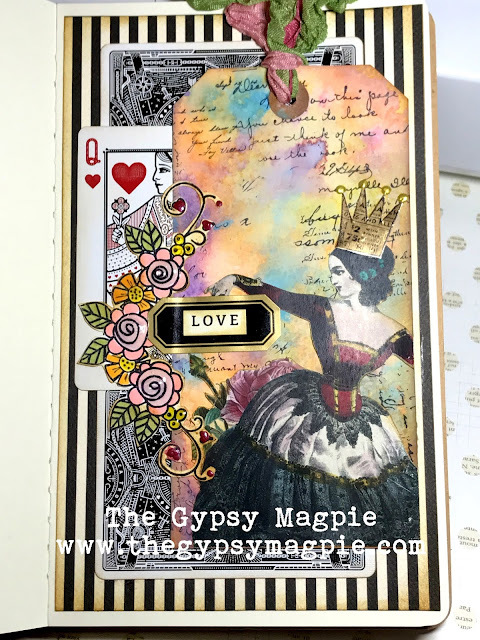 I love this fabulous mix of gorgeousness! This is so clever, Terri! 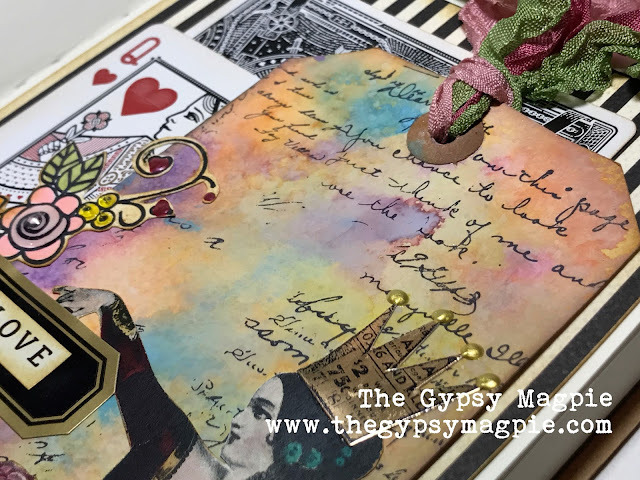 I love how you mix and match Tammy's stamps to create such mixed media goodness. Love it! Love love love this! The color palette is full of rainbows and your Queen is gorgeous! I love your style!! !